I would like to introduce you to my friend and fellow mobileWOMAN, Karen Fiera. Karen and I live in the same town and for a time, attended the same church, however, we met online in 2011. not in person. 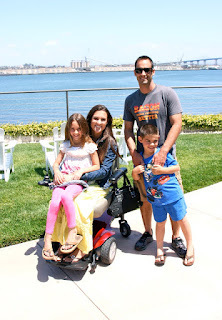 We instantly bonded over the shared journey of living and parenting, through a chronic illness and disability. We have shared the ups and downs of a journey that we never expected to take. We pray for one another when one of us is in the hospital or having a setback, and we praise together when we experience the rare, precious moments of "normal". When those Facebook memory posts appear, clearly showing the "before", we cry together at everything we have lost. We "get" each other, we have given up so many of the same things and we lessen the hurt they cause through our prayers and friendship. Karen has graciously allowed me to share her story here. Karen and her husband Anthony, were living a quiet life raising their 2 children and enjoying an active Southern California lifestyle. Life as Karen knew it, changed in 2009. The plans and dreams that she thought she could count on, were much different than the life she felt God had planned for her. 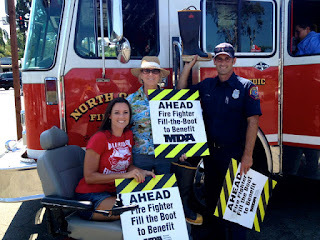 After successfully completing the breast cancer 3 Day Walk in San Diego, in 2008, Karen was eager to participate again in 2009! The first day of the walk, she sustained injuries to her hip, knee and shins. As the walk went on, Karen began experiencing extreme pain. She continued the walk, willing her body to push past the pain. Karen remarked to her husband that she was just injured a little and it wouldn’t kill her. They kept walking, hand in hand for 60 miles, Karen completed the walk. Following the walk, Karen's injuries did not improve and she began seeing doctors and seeking answers. It would take months to find them. Even when the doctors had an answer, it only seemed to lead to more questions. Karen finally had a muscle biopsy done in August of 2010, the results would change her life forever. Karen was diagnosed with a rare genetic disorder called Mitochondrial Myopathy, a form of Mitochondrial Disease. 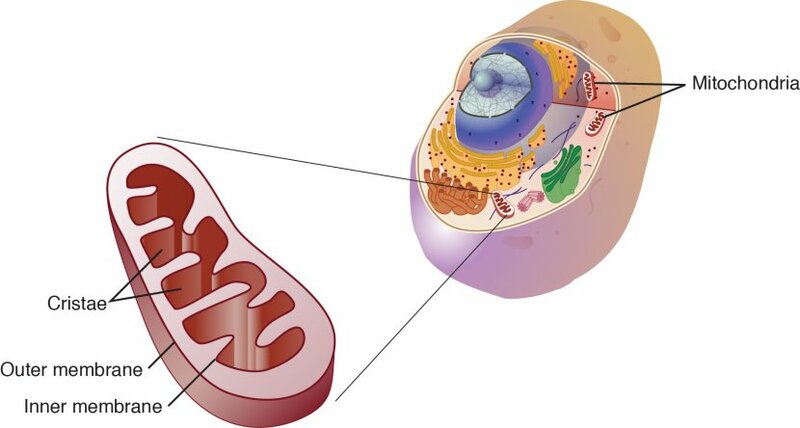 Mitochondrial disease is a group of disorders caused by dysfunctional mitochondria, the organelles that generate energy for the cell. Mitochondria are found in every cell of the human body except red blood cells. 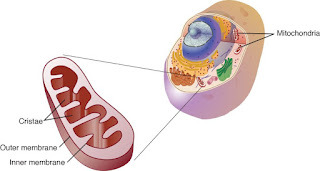 Mitochondria convert the energy of food molecules into the ATP that powers most cell functions. This disease affects every system of the body, causing a slow decline in function. The symptoms Karen experiences are: muscle weakness and muscle fatigue, this has lead to her use of a power wheelchair, migraines, slurred speech, Raynaud Syndrome, vertigo and vestibular weakness, complications with the endocrine system, breathing and heart problems, autonomic dysfunction which causes blood pressure and body temperature problems. Because Karen is not able to regulate her body temperature, she and her family have had to give up their vacations in Lake Havasu, Arizona. Karen shared with me that this has been one of the hardest things to accept. Despite the overwhelming symptoms that she deals with every day and countless personal losses, Karen never loses her positive attitude or her deeply religious Faith. Karen's smile never ceases. Her smile shines brightly whether she is enjoying the beach with her family or in the ER with an infected PICC line. Each Instagram post, each update, always includes that amazing smile! I am inspired and humbled by my friend's resilience and Faith. Karen shares: "I have become closer to God than ever before through all of this. I have always had a strong relationship with God, but getting sick has helped me see the light. I see beauty everywhere I look. I find joy in everything I do. I am not walking alone. Even when I have those moments that are so dark and scary, He is there to lift me up. I know He will always be there. Faith is the one thing I have not lost." Karen goes on to say: "Having something like my health taken away from me has given me strength, in other areas of my life. I love more passionately, I have more patience, I can see clearer, I have a deeper appreciation for life and am extremely grateful for the love, and friendships that I am surrounded by. I don’t know what kind of future I have in store for me, but realistically, no one knows. Only God does. I love my life and pray that I can stick around a little longer." However, the beauty of day to day life for Karen doesn't always mimic the gorgeous Southern California sunsets that fill her Instagram story. Life with a disability is hard, and parenting with a disability makes everything harder. Karen has 2 children, Alexis age 13 and Wyatt age 11. Karen and Anthony have chosen to homeschool both children. This, Karen says, is a perfect fit for the whole family. Homeschooling allows the family the flexibility that they need and Karen has a ton of local support. With homeschooling, Karen can tailor her schedule to her needs. Karen says: "Choosing to school the kids at home, was the best decision. They are thriving and I am less stressed than when the kids attended traditional school. Alexis and Wyatt have become very independent since being homeschooled. I see them having more confidence and patience. They help me alot and they never complain, if we cannot go out or they miss activities. I am not a disabled mom. To Alexis and Wyatt,, I am just mom." That doesn't mean doubts don't occasionally creep into Karen's mind. "Some days I feel like I am cheating my kids out of a stress-free, healthy, super active lifestyle. Recently, I was driving and one of my "river songs" came on the radio, I turned the volume way up. That's when it hit me. The tears flowed effortlessly down my face as I realized how much I missed my life. I want it back and I want it back now. I want boat rides and I want to be able to handle heat above 70. I want long walks and dinners out with friends. I want to laugh without causing pain. I want unplanned adventures and spur of the moment trips. I want to play catch with my kids, I want to swim with them and chase them around. I want to smile because I feel good, not because I'm hiding the pain. I have been so busy surviving each day, being grateful for the life that I do have that I didn't even realize what I have lost. I couldn't stop crying as I was thinking of the great memories we made on our summer vacations. Vacations... a word of the past. A word that makes my body cringe thinking about it because I'm not sure if I can muster up enough energy to take one. Vacation, a word that my family craves. Dream vacations are what we discuss at the breakfast table. Everyone saying where they want to go and what they want to do. Once breakfast is over, we sigh and start our day, wishing and hoping that one day we will take these vacations." Karen and I talk about the loneliness that we feel at times. The well-meaning friends and family, just don't get it. All too often after you become sick or physically impaired, the invites stop. People assume that you won't be up for a night out to dinner or a quick lunch with friends. “Can your chair handle the steps?” “Is the location accessible?” Instead of people making a decision about our abilities, the decision should always be ours. "It hurts when someone slips up and talks about a great night out or when the family all got together and you didn't even get a phone call. It’s painful to just stop being included altogether." Karen wants people to know that disability can mean feeling isolated. "People will run. They will run to you or they will run away from you. I have had my family, friends, husbands co-workers, and neighbors, at my side through all of this.” Karen has lost touch with some friends, however, she has also had the most delicious dinners, dropped off by the best of friends. Karen has the "Help, love, prayers and support from my angels. I know these people will always be there for me. Grateful isn't even a strong enough word to express my appreciation for them. I know that God will lift us and those around us." By far, Karen's biggest support is her husband, Anthony. 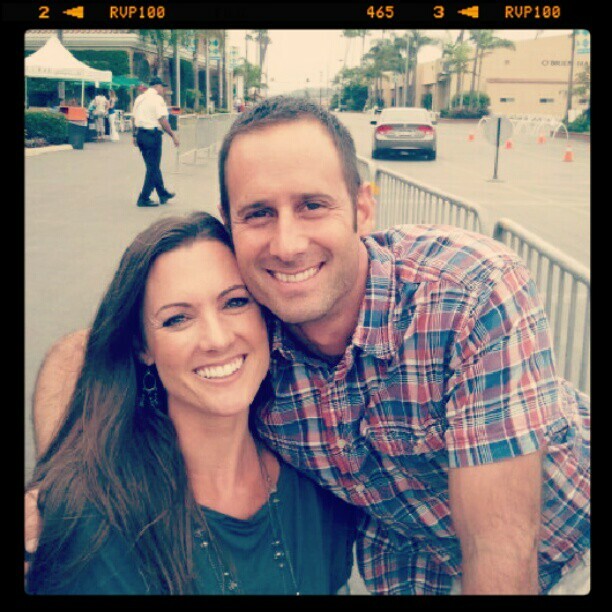 "Anthony has been my caretaker, my husband, my rock and the coolest father to my children. (their words) His hand is the last one that I hold as I am being wheeled into surgery and the first one I reach for while I am trying to wake up. When I can't cope, he dries my eyes, he fights my fight, he holds me tight. He won't let me fall. He is my advocate and he is my protector. I feel safe with him. He gets me through each day." Another commonality that Karen and I share, is that what you see on the outside doesn't always match how we feel inside. "I have a chronic illness that doesn't have a cure and will continue to progress, no matter what I do or don't do." Saya Karen. "Along with it being a chronic illness, it is also an invisible illness. You can't see it by looking at me. Just because my outside doesn't match my inside doesn't mean that I'm not still sick. Just because I have an optimistic outlook and a smile doesn't mean I'm cured." "My health is unpredictable, my life is unpredictable. Some days I am feeling great, some days I am not feeling so great. Some days I can eat like a normal person, some days I can't, some days I can't even drink water. Some days, I can't drive or leave the house or join my family on fun adventures.Some days, we are surrounded by so much love and support and some days, I feel so alone." In her blog, Karen speaks about the biggest impact that her illness has had on her, the loss of her mobility. "It's been years since I have been able to run around on the beach. It's been years since I have been able to go for a long walk. It’s been over years since I have had a day go by that it's not on my mind. As Anthony and I were driving down the coast recently, we had the windows down and warm air blowing was through the car. In that moment, I wanted more. I really feel like I have accepted the disease and am grateful for all that I DO have but I wanted that walk on the beach holding my husbands hand. I wanted to walk around just like the thousands of other people were but the truth is, I just can't." The day Karen's power wheelchair arrived was a difficult day for her: "I am grateful to have the chair but I HATE that I need it. I think that there can be a certain stigma associated with people in wheelchairs. It means you are sick or 'not able'. At least that is what healthy, able people think. That is what I used to think. I would see someone in a wheelchair and know that something was wrong. I can easily hide that something is wrong with me because on the outside, I look very healthy. But now I can't hide it. It doesn't really fit my style. I was a mom that would run around with her kids and had such an active lifestyle. I need that back. When I'm in it, I feel great but if I catch a glimpse of myself in a reflection I get so emotional. I want so badly for this to be temporary but am really fearful that it won't be." Finally, Karen and I talk a lot about making sense out of the detours that our lives took. "I think there is a fine line between denial and acceptance. You see, I have a disease that I can't make go away. Yet, I live with so much joy and happiness and I try so hard to ignore this disease, destroying my body and my mobility. Ignoring it sounds like maybe I am denying it, right? Like I'm not really accepting what's going on. Except that I do accept it, I just can't do anything about it, physically. I can't take a magic pill and cure it. I am aware of what could possibly happen to my body. The doctors have told me but they have also told me that I am so unique that it's hard to tell what the future holds. Being unique is great! I prefer the uncertainty of the future, over being told that I have no hope of living another week. I get to live. I get to breathe fresh air every day and I get to laugh. I get to choose how I want to feel emotionally and I get to choose, for the most part, how my day will go. Choosing to throw the yuck out the window and let in the happy, doesn't exactly mean that I'm in denial. I know what's going on with my body. I feel it constantly. I've accepted that I'm not ‘normal’ and most likely won't be, ever. But there's this thing called hope and I hang onto it so hard. We have this hope as an anchor for the soul, firm and secure. - Hebrews 6:19." Karen and her doctors don't know what the future holds, as of now, the disease is progressing, causing severe muscle weakness throughout her entire body. She can no longer do the things that she used to be able to do. But that does not stop Karen, "We just learn to do things in a different way. Maybe it's foolish of me to keep the amount of hope that I do but it's what I choose. It's what gets me through the day, knowing that I really can wake up tomorrow and feel better, completely better. Because with God, all things are possible. We will just have to adapt and do things in a new way."